Learn how to become an exceptional caregiver in Canada’s evolving health care environment! 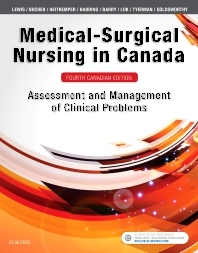 Adapted by a team of 4 experienced Canadian nurse-educators and a slate of expert contributors from across the country, the 4th Canadian Edition of Medical-Surgical Nursing in Canada offers up-to-date coverage of the latest trends, hot topics, and clinical developments in the field. Completely revised and updated content explores patient care in various clinical settings and focuses on key topics such as patient safety, exam preparation, evidence-informed practice, prioritization, patient and caregiver teaching, culturally competent care, and the determinants of health. A variety of helpful boxes and tables make it easy for students to find essential information and the accessible writing style makes even the most complex concepts easy to grasp. Best of all — a complete collection of learning and study resources helps students learn more effectively and offers valuable, real-world preparation for clinical practice. UNIQUE! "Levels of Care" approach organizes nursing care in three levels: health promotion, acute intervention, and ambulatory and home care. Associate Professor, Teaching Stream, Lawrence S. Bloomberg Faculty of Nursing, University of Toronto, Toronto, ON. Assistant Professor, Teaching Stream, Lawrence S. Bloomberg Faculty of Nursing, University of Toronto, Toronto, ON. Professor, Trent University/Fleming College, School of Nursing, Peterborough, ON.